The total samian assemblage comprises 4937 sherds, weighing 79237g, and forms just 1.2% by weight of the total pottery recovered. 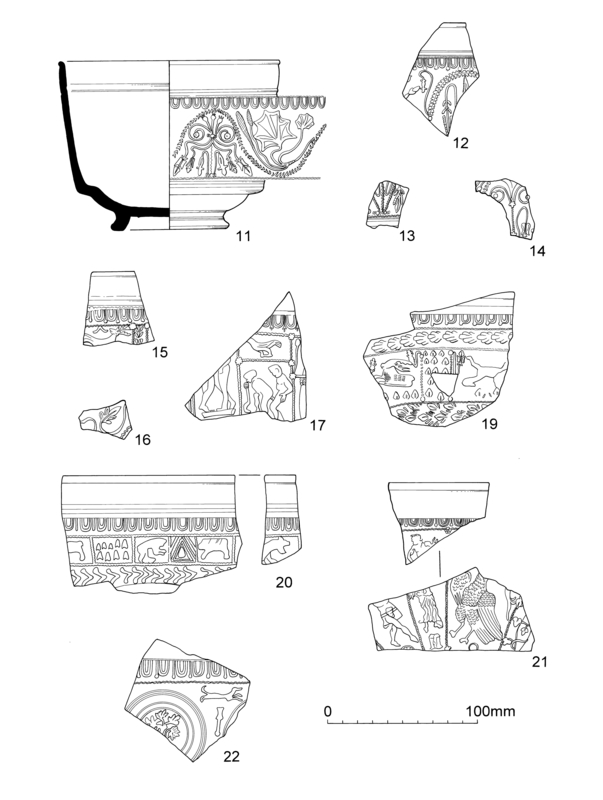 The samian was identified and dated by Brenda Dickinson and catalogues of the stamps and decorated vessels were produced (see below). The Arretine ware (Italian-type sigillata) was isolated and subsequently identified and dated by Joanna Bird (see below). Figure 309 shows cumulative vessel losses at 5-year intervals. 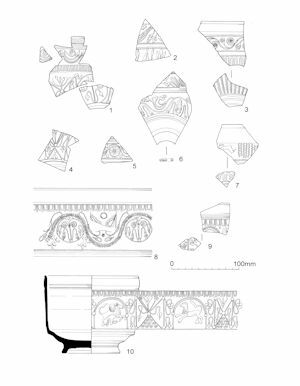 As part of the English Heritage-funded Samian Project, Steve Willis accessed the samian data in advance of publication and produced an overview of the trends at Elms Farm compared with a range of assemblages recorded elsewhere. The following report encompasses both sets of work. The Italian-type sigillata consists of twenty-five sherds representing a maximum of twenty vessels; eighteen platters, including seven examples of Conspectus form 12, and two cups. The majority of the pieces, including the single stamped base, are in a fine fabric with some colourless mica flakes visible in the section. Without analysis no certain source can be suggested for this fabric, which is a very pale brown or beige in colour, with a brownish tint to the slip. The material is mostly dated c. 15 BC-AD 10, with a few pieces that could date up to c. AD 20. The most striking feature of the South Gaulish ware from La Graufesenque is that the f30 bowl form accounts for almost one quarter of the identified decorated ware and 37% of the commonest forms (these being bowls f29, f30 and f37). The cylindrical bowl f30 survived throughout the entire period of samian export, but normally makes only a modest showing against the more popular hemispherical f29 and f37. Most of the examples at Heybridge are Neronian and it is not impossible that they formed part of a single consignment. It is also curious that two complete bowls were buried together with a complete, but pierced, grog-tempered jar and a large lid. There are few other known instances of such an occurrence and no convincing explanation occurs (see also The structured deposition of pottery). The globular jar, f67, is generally even rarer and the number found here (eleven (0.24%), with possibly three more), though modest, may seem worthy of mention. The remaining eight South Gaulish pieces consist of a single vessel from Montans and seven from Banassac. First-century Montans ware is not particularly common in Britain, but small quantities have been noted in London and the west Midlands, particularly. The occurrence of Banassac ware is similarly sporadic, but rather more widespread, appearing on sites as far north as Carlisle and Old Penrith. The pieces found at Heybridge all belong to the first half of the 2nd century and it is not impossible that they arrived in a single consignment. The 1st-century assemblage also contained seven pieces of Lezoux ware, two of them decorated. This, again, does not occur in large quantities on any British site, apart from London, but its distribution is wide, and it has been noted on at least two sites in Scotland. The samian supply to Heybridge diminished in the Trajanic period. This is not necessarily significant, as Trajanic ware from the Central Gaulish factory of Les Martres-de-Veyre was unevenly distributed in Britain, and a good many sites received noticeably less samian in the first two decades of the 2nd century than they did before or after. The same is apparent in the published samian from Colchester (Symonds and Wade 1999, 3 and 120). Increasing quantities of samian began to be discarded at Heybridge in the AD 120s with the arrival of Lezoux ware, but it was not until the early Antonine period that noticeably larger amounts were being discarded. This high level was maintained down to c. AD 180. The bulk of the collection is 2nd century and so, as would be expected on a British site, consists mainly of Central Gaulish ware from Lezoux. This was supplemented by East Gaulish ware, particularly towards the end of the 2nd century and by British wares from Colchester and, probably, Pulborough. The 3rd-century supply is entirely East Gaulish. A notable aspect of the samian, which may again hint at the remains of a single consignment, is the popularity of the work of Cettus of Les Martres-de-Veyre, ten of whose bowls were found. Like some of the recovered plain ware from that factory, they are Hadrianic-Antonine in date. The geographical position of Heybridge makes it a prime candidate to receive Colchester samian, and a maximum of 101 vessels was found. Only five of these were decorated. Unfortunately, the scarcity of comparable East Anglian assemblages makes it difficult to assess the importance of this find. The much smaller assemblage, of approximately 357 samian vessels recovered from Scole (Hartley and Dickinson 1977, 155-72) produced only 0.8% of the total vessels in Colchester ware, against 2.2% from Heybridge. This, of course, could be explained by its greater distance from the kilns. Colchester ware at Chelmsford was seemingly rare, amounting to just a trickle of sherds (Rodwell 1987b, 97). The other British pottery source whose wares almost certainly occur is Pulborough, represented by three vessels. The distribution of this pottery is confined mainly to Sussex, Hertfordshire and Essex, but occurrences are also known from Surrey, Norfolk (twice) and London, with one example as far afield as Sea Mills in Gloucestershire. The earlier East Gaulish samian consists almost entirely of La Madeleine ware, which accounts for 7.2% of the East Gaulish assemblage. La Madeleine supplied samian to Britain in the Hadrianc and early Antonine periods and seems to have maintained a steady, if relatively modest, trade with the province. Also 2nd century are four vessels from the Argonne and single examples from Heiligenberg and, perhaps, Blickweiler. A larger proportion (14.9%), much of it 3rd century, was supplied by Trier, but the bulk of the East Gaulish ware (73.9%) comes from Rheinzabern and some of it is certainly 2nd century. A small proportion of the East Gaulish samian cannot be assigned to specific potteries. Owing to the erosion of the sherds in much of this collection, it was only possible to detect cross-context joins between decorated pieces, though a few others were noted. No further work was done regarding cross-context joins since sherd links for the coarse pottery were only fortuitously recorded, because of the large volume of pottery involved. The highest concentration occurs in the central zone of the settlement, with a marked decrease eastwards and northwards (Table 12). Distribution of the samian by area is shown in Table 13. The fluctuations in the pattern of accumulation of discarded samian is normal for a British settlement occupied throughout the period of samian import into the province, with the bulk of the assemblage consisting of South Gaulish and Lezoux ware, with lesser contributions from Les Martres-de-Veyre, East Gaul and other factories whose wares are uncommon in Britain. A small quantity of Arretine ware, with a date range of c. 20 BC to AD 25, was found. Unlike some of the other pre-Roman settlements in the south and south-east where it occurs, there is no contemporary samian. The absence (with a single exception) of typologically Tiberian forms is striking and, indeed, there seems to have been no significant build-up of discarded samian before c. AD 50. It had reached its peak in the 1st century by c. AD 60-65 and by c. AD 80 the level had dropped noticeably and did not recover until the early Hadrianic period. If the trend suggested by the samian is to be believed, the settlement did not suffer at the hands of Boudicca, and the burnt sherds of relevant date are no more than might be expected in a random collection of this size. Most of the sherds have been dated according to the reigns of emperors or dynasties, but it was possible to date much of the decorated ware and the identified potters' stamps on plain ware more closely, and this is likely to give a truer picture. Figures 309 and 310 shows the discrepancies caused by the use of two different methods and the danger of assigning wide date ranges to large volumes of sherds. While the 1st- and 2nd-century peaks coincide, there is a conflict in the early 2nd century, with the broader dating suggesting an upsurge in discards c. AD 120, and a date five years later by the decorated and stamped vessels. The latter is more likely to be correct, reflecting a time when the supply of Lezoux samian to Britain had got into its stride. Similarly, the start of the final decline in the supply is more likely to have begun c. AD 180, as suggested by the decorated ware and potters' stamps, than AD 200, by which time the export of Central Gaulish samian to Britain had almost ceased and the quantities of East Gaulish ware reaching the province were comparatively modest. D45	(Not illustrated) Bowl f37, East Gaulish (Argonne). The surface of the bowl is heavily eroded, but a row of lions can be seen, with other animals below. A basal wreath is composed of opposed bifid motifs (Oswald 1945, fig. 6, LVII), which occur on two bowls from Lavoye with mould-stamps of Tocca (Oswald 1945, fig. 9, no. 35-6). c. AD 140-180? Layer 9454 (Group 8012), Area D, unphased. Each entry gives: Potter (i, ii, where homonyms are involved), die, form, reading, published example (if any), pottery of origin, date, context information. Stamps on the decorated ware, above, or from key pottery groups, are discussed in detail. (a)	A stamp attested at the pottery in question. (b)	Not attested at the pottery in question, but other stamps of the potter known from there. (c)	Assigned to the pottery on the evidence of fabric, distribution, etc. Brenda Dickinson's report provides a substantive guide to the samian pottery recovered, identifying major trends and including a comprehensive catalogue. Her work enables some further aspects of the use and consumption of samian to be considered and compared with wider patterns discernible in Roman Britain. Samian is, of course, a particularly useful artefact class for the archaeologist given: (i) its standardisation of form and fabric, (ii) its sequential typological development, change in decorative detail and stamps, that are well understood and facilitate relatively close dating, and (iii) its wide distribution and reporting, which enable comparative analysis. Various studies have demonstrated that samian was particularly valued or prized among contemporary communities. Distinctive and unusual in appearance compared to other contemporary pottery types, samian is perceived, by archaeologists, to have been a high-status commodity. Certainly across Britain, samian was in the vanguard of imports arriving at indigenous sites in the years following the conquest and circulated in a manner different from other pottery types (cf. 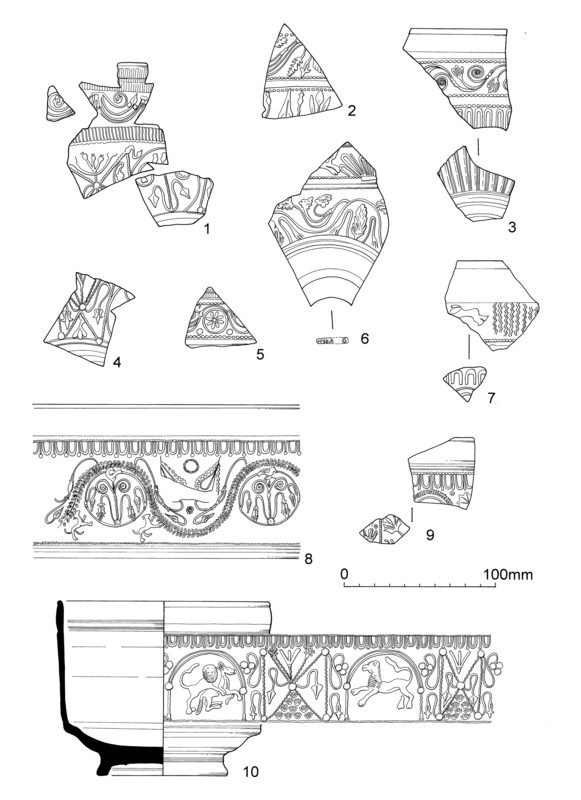 Willis 1997a; 1998); some samian assemblages even appear to represent 'diplomatic' gifts (Haselgrove et al. in press). Evans' study of graffiti on Roman pottery (Evans 1987) has shown that samian was much more frequently inscribed with names and marks than other pottery types, with marking evidently expressing a concern to denote ownership (see this publication for an alternative interpretation of X-graffiti ). Further, studies of the repair of broken pottery vessels via lead riveting or cleats shows that samian was repaired with disproportionate frequency compared to other types of vessels (Marsh 1981, 227; King and Millett 1993, table 16.5; Evans 1996a, 89; Evans 1996b, 62; Booth 1997, 123). In other words, a broken samian vessel was more likely to be repaired than any other type of pot, and this is a widespread pattern, identifiable at all types of site. 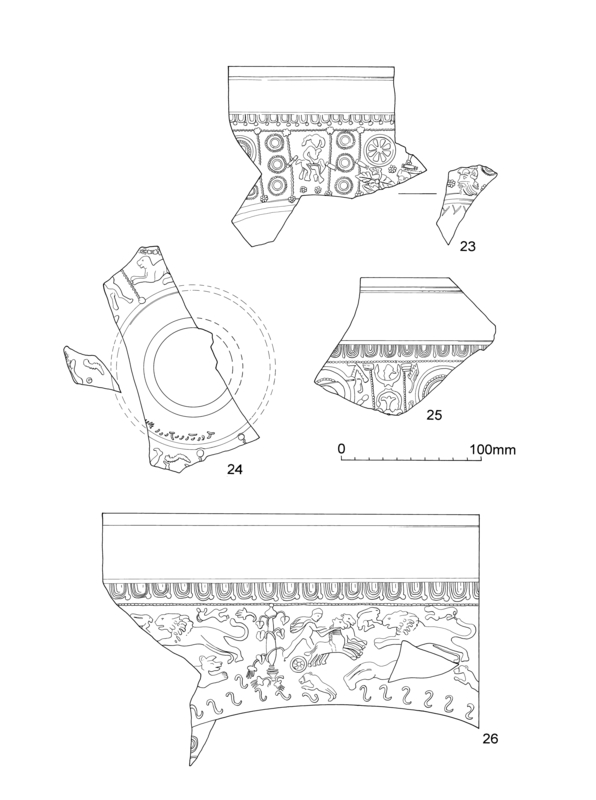 The large majority of decorated samian vessels are bowls and it seems that these vessels may have been particularly valued, either because they were relatively expensive (reflecting the amount of labour taken to produce them, plus transport costs) or perhaps because the form and finish were attractive for use as (communal?) drinking vessels. Overall scrutiny of the incidence of samian seems to confirm that it was, indeed, a status symbol, relating to wealth, social and cultural identity (Willis 1998). Samian, therefore, can be a sensitive indicator of a range of processes to a degree that is not possible with other pottery types of the period. 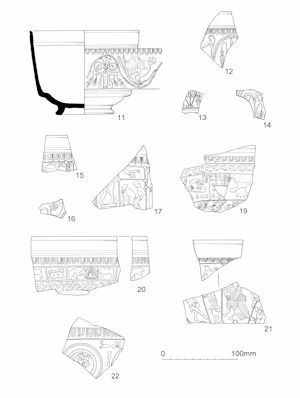 For these reasons it is potentially useful to explore further the character of the samian assemblage recovered, with the advantage of such a large sample of this pottery having been recovered. Recent studies have shown consistent differences in the pattern of samian occurrence that seems to reflect site type strongly. Major towns and sites associated with the Roman military show a pattern of more frequent samian use and deposition, while at others (small towns, roadside settlements, religious foci and rural sites) samian is much less frequent relative to other pottery types. Variations in the frequency of samian at different settlement types appear to have been socially structured. Differences in access to quantities of samian may have had an economic basis (i.e. it may not have been easily affordable), and/or particular cultural attitudes may have been influential (e.g. at some types of site samian may have been considered an important regular mechanism of status display among certain social groups, and a symbol of 'Romantitas' and wealth, while at others, people may not have used sets of samian as a regular everyday status symbol, but less often, for specific purposes or events). 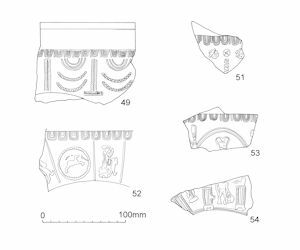 Comparison of the samian assemblage from Elms Farm with patterns recently identified for other sites in Britain is potentially instructive. In order to establish the nature of samian use and consumption at Heybridge, several approaches have been adopted. A useful index of the general pattern of samian use and consumption can be established by quantifying its occurrence within a series of phased pottery groups. As noted elsewhere, the key groups are considered to be both representative of the pottery being consumed at the site through various phases and 'good groups' from a methodological point of view. The data from these groups have been supplemented here using those from the 'wider pool', that is, further good, representative and stratified groups, which are also used elsewhere in the analysis of the pottery assemblage. Combining the quantitative information from these groups by phase results in unusually large samples, which should provide a reliable guide to the overall frequency of samian consumption through time. Data on the occurrence of samian within these groups are presented in Tables 14 and 15. 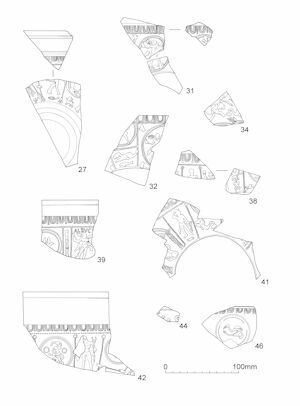 The data are derived only from groups in which samian sherds are present (which is a function of the data available to this author), and exclude, also, groups that appear to include structured special deposits, or, in one or two cases, some intrusive sherds. In effect, these criteria omit only a few of the key and wider pool groups (omissions from the key groups comprise the following: Ceramic Phase 4; KPG17 (20008), which appears to represent a structured element, and KPG15 (9214), which included no samian: Ceramic Phase 7; KPG26 (6280) which also seems to represent a structured element, and KPG27 (1589), which included no samian). That a small number of groups with no samian have been excluded from the analysis means, of course, that any figures indicating the percentage of samian pottery within phases slightly over-represents the actual frequency of this ware per phase vis-à-vis other pottery wares. Table 14 shows the frequency of samian among pottery groups by phase when EVE is the measure; Table 15 shows the equivalent data where weight is the measure. Weight proportions are a good measure when the intention is to compare the composition of groups over time, between sites, etc., while EVE is also suitable for this purpose, it gives an impression of vessel turnover (cf. Orton 1989). Orton (1989) has recommended that both these measures be employed where possible. For reasons discussed below, one should not anticipate that these two measures will yield like results in terms of percentage figures etc. though they should, significantly, show similar trends. The data reproduced in Tables 14 and 15 show that despite the fact that, in absolute terms, a very large sample of samian was collected during fieldwork, it forms only 2.2% by weight of the pottery being deposited. It is noteworthy that although the quantities of samian within these groups are invariably modest, it is rarely absent from sizeable groups. Considering, firstly, Table 14, a general pattern of low percentages is consistent through time and presumably reflects a comparatively low frequency of use of samian ware. Samian is present in Ceramic Phase 3 but forms only a tiny fraction of the pottery of that phase; this is not surprising since, away from Roman military sites and major aggregated centres, samian is generally only occasionally found among contexts dating to the mid-1st century AD (cf. Willis 1997a). The samian percentages for Ceramic Phases 4 and 5 are remarkably similar to each other and imply continuity in the consumption and deposition of samian through the early Roman period. These data are likely to be a reliable index, given the robustness of the sample (for these are large samples and combine data from six and nine good groups respectively). Samian data from other sites in Britain (e.g. Marsh 1981) indicate that there was a peak in the supply and consumption of samian in Britain during the Flavian period (c. AD 70-100). Ceramic Phases 4 and 5 overlap with this peak, and it is possible that any effects on consumption at Heybridge during periods when the general supply of samian in Britain was lower, namely during the Neronian period (c. AD 55-70) and the Trajanic-early Hadrianic period (c. AD 100-125), are masked within the generality of the ceramic phasing. Brenda Dickinson notes that the period c. AD 100-120, during the time when the principal source of samian was Les Martres-de-Veyre, was one of markedly limited samian supply to Britain. 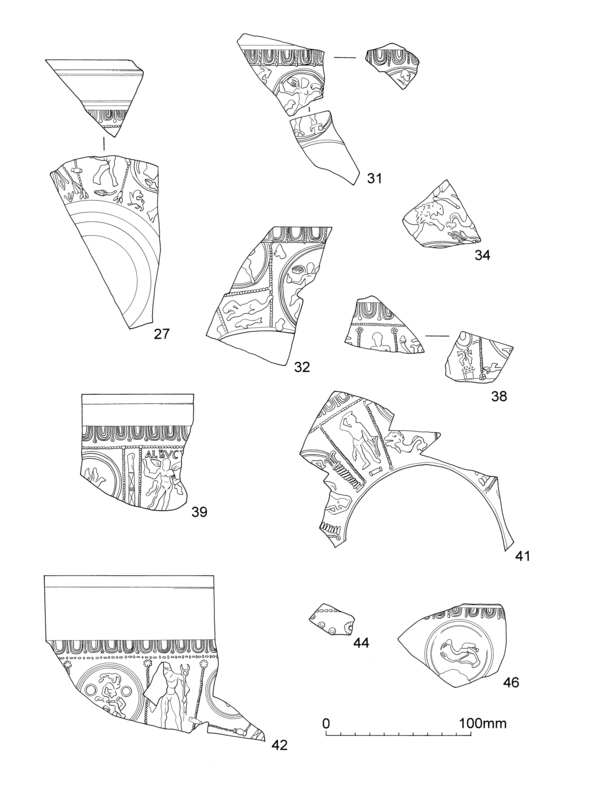 Analysis of the samian from specific sites (e.g. Southwark), as well as general trends in deposition (cf. Willis 1998, 102-5), indicates that there was probably some careful curation of older samian vessels during this period of low supply. Again, this may be reflected in the consistency of the samian data from Ceramic Phases 4 and 5. Moving into the 2nd century, the proportion of samian among the sample relating to Ceramic Phase 6 is 8.3%. This represents a doubling of the percentages for Phases 4 and 5, but probably does not reflect a change in cultural practice at Heybridge, but rather may relate to the general increase in samian appearing in Britain from the early Antonine period (from c. AD 140), supplemented in the Essex region by local production of Colchester samian from c. AD 155 (cf. Tyers 1996, 114-16). 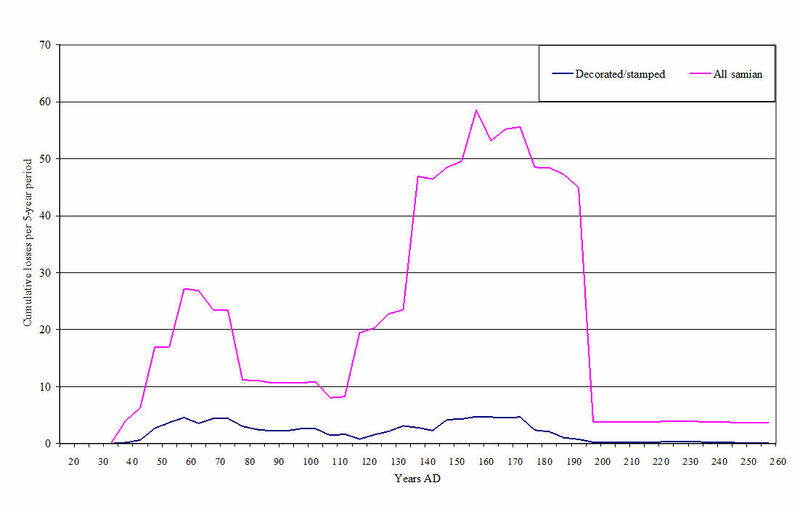 The frequency of samian dips dramatically, and unexpectedly, in the sample relating to Phase 7. It is likely that this anomaly is due to the sample being less representative than others, for it comprises, regrettably, data from just three groups, with one group numerically dominant (KPG25). It should be noted, however, that there is less pottery of all types in CP7. The proportion of samian in the sample from Ceramic Phase 8 returns to a similar level as that of Phase 6. The majority of the samian from this first half of the 3rd century phase is Central Gaulish. One might suspect that a proportion of these items are residual from earlier phases, but it is also likely that the normal 'life cycle' of some later Central Gaulish imports meant that many of these vessels were still extant into this period, and, again, curation of fine ware vessels in a period of low samian supply is also highly probable. When weight is the measure, a general similarity in trends is apparent (cf. Table 15). Percentages are very low by this measure. This is to be expected since samian is a fine ware and includes a range of comparatively thin-walled and small forms, including cups and dishes. Such vessels, when broken, produce comparatively light sherds when compared to other types such as some storage and cooking jars whose sherds may be individually comparatively heavy. What is particularly archaeologically significant is not that there may be correspondence between the results of these measures in terms of actual figures and percentages, but that they show trends in the relative frequency of pottery that assists comparative analysis (cf. Orton 1978). Considering Table 15 overall, there is good agreement with Table 14 in terms of the comparative frequency of samian. The weight data confirm that samian comprises only a tiny fraction of the pottery of Phase 3. The samian percentages for Ceramic Phases 4 and 5 are again consistent, suggesting continuity in samian consumption and deposition through the early Roman era. 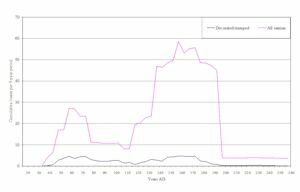 Moving into the 2nd century, the proportion of samian among the sample relating to Ceramic Phase 6 is 1.8%. This proportion is very small, though as with the EVE measure this represents a doubling of the percentages for Phases 4 and 5. The frequency of samian dips in the sample relating to Phase 7, as it does when EVE is the measure, though by weight it is less marked than with EVE data. The percentage is higher than in the 1st-century groups. Again, the proportion of samian in the sample from Phase 8 returns to a similar level as that of Phase 6, a pattern seen also by EVE. It is instructive to compare these data with others in Roman Britain. Table 16 documents the average percentages that samian pottery comprises, by weight, within groups from a variety of site types. This provides an approximate guide to the general frequency of samian c. AD 40 to 200 (unfortunately, there are insufficient data yet published nationally to enable a similar table to be generated where EVE is the measure, though see Table 14). Work for the English Heritage funded Samian Project has shown that there is a strong correlation between the status and identity of sites and the proportion of samian within the groups recovered from such sites (Willis 2005). By this measure, Heybridge compares well with the pattern seen at Roman 'small towns', roadside settlements and, indeed, rural sites. Considering pottery groups from sites of 'small town' or roadside settlement status, several cases of higher frequencies of samian than at Heybridge can be noted. At Braintree, for instance, conventionally seen as a Roman small town, samian formed 5.8% of the pottery from well 102 and ditch 307 (group size: 4.4kg) at College Road, dated c. AD 150-250 (Martin 2000a). At Meole Brace, Shropshire, samian accounted for an unusually high 7.5% of the pottery from Phase 3 (group size: 15.4kg), c. AD 210/220-230 (Ellis et al. 1994). Similar percentages occur among groups from roadside settlements, for example in the case of a series of groups at Neatham, Hampshire (Millett and Graham 1986; Willis 1998, table 1), at Pomeroy Wood, east Devon, where samian forms 2.9% of the pottery from Phase 4i (47.4kg), dated c. AD 90/100-260 (Fitzpatrick et al. 1999), and, in Oxfordshire, at Wantage, Mill St, where samian accounted for 2.2% of the 8.4kg of pottery from Phase 1, dated to c. AD 70-160 (Holbrook and Thomas 1996). In Essex, a samian percentage of 1.1% is recorded from a pit at Great Dunmow (gravel pit 857) for the period c. AD 190-230/240 (Going and Ford 1988; Willis 1998, table 1) consistent with contemporary levels at Elms Farm. Two samples from Coggeshall show marked variation, though this evidently relates to the context of these finds. A lower percentage than at contemporary deposits at Elms Farm is recorded from the St Peter's School site, where samian formed a mere 0.02% of the pottery from Phase 4.1 (16.1kg) dated to c. AD 65-150. This probably reflects the likelihood that the fieldwork was located away from the settlement nucleus (Clarke 1988). Conversely, at The Lawns, a sample dated to c. AD 140-200 (Phase 4.2) had a relatively high percentage for samian of 6.4% (Martin 1995). In this case, this may be a function of the small size of the sample (1.6kg) but the sample appears to be associated with a building of some importance (Isserlin 1995). Some comparative data for rural sites in the region are available. At Buildings Farm, just west of Great Dunmow, a group of c. 12.2kg of pottery dating to c. AD 35-100 included samian, though this constituted just 0.6% of the group (Wallace 1997). Amongst a similarly sized group from Old House, Church Langley, dating to c. AD 120-165 samian accounted for 1.2% of the pottery (Martin 2000b). At both, the proportion formed by samian is lower than in the contemporary phases at Elms Farm, albeit marginally so. In sum, comparison with data from other sites demonstrates that the proportions of samian within phased groups at Elms Farm are in broad accordance with proportions at other smaller nucleated centres. Heybridge has somewhat higher relative frequencies of samian than occur at a range of rural sites, though the difference from proportions at rural sites is essentially marginal. Data by EVE are available for various sites in Essex; this information, with regard to samian, is reproduced in Table 17. It can be seen that samian is generally rare in the early post-conquest period, but clearly becomes more frequent in the 2nd century. In other words its frequency over time at Heybridge reflects a broader pattern in the county. That the data relating to Ceramic Phase 7 at Elms Farm (later Antonine to early 3rd century) are anomalous is again emphasised when set against the samples from Rivenhall and Chelmsford. It is noteworthy that both the early to mid-3rd century groups listed have similar proportions of samian to mid- to late 2nd-century groups, emphasising that samian was apparently still being used to a significant degree into the 3rd century, a period when imports of new samian were more limited than previously. As shown above, the data for the individual stratified groups were summed by phase to generate robust figures for comparative analysis. Some attention to the frequency of samian within the individual KPGs and wider pool groups is instructive. Again this is via EVE and weight. This analysis demonstrates the previously identified tendency for EVE data to produce indecisive results when sample size is small or moderate (e.g. Orton 1982). This occurs because the presence of a single rim sherd of a certain type within a group with a modest overall EVE size can have a significant impact on the percentage figures. Hence weight data are a more reliable indicator in this instance. The data by EVE are presented here as a matter of record and for methodological interest. Table 18 lists the proportion of samian within each KPG and wider pool group, in which samian rims occur, by EVE (pool groups with intrusive material are excluded). Two groups including likely structured deposits are included here, however. There are six groups of Neronian-early Flavian date (Ceramic Phase 4). Excluding Pit 20008 which represents a likely structured deposit, the proportions of these groups formed by samian range from 1.7% to 15.9% and none is particularly near the mean for this phase of 3.4%. The groups with the lowest proportions of samian are the markedly larger groups, and the three comparatively high proportions are associated with quite small groups. Seven groups of Ceramic Phase 5 are represented, covering the period c. AD 80-125. As with Ceramic Phase 4, the data show a wide range of proportions of samian within these groups. Samian forms a conspicuously high 23% of the sample from Ditch 6646, though this is clearly an effect of a small EVE sample size (compare the percentage when weight is the measure: Table 19). Conversely samian forms only 0.5% of the large group from Pit 13771, but this reflects an absolute paucity of samian from this feature. There are ten Hadrianic to mid-Antonine groups (Ceramic Phase 6) and these show marginally less variation than with the preceding samples. Eight of the ten groups have samian proportions of c. 6% or more. The highest proportion is 33% among the smallish sample from Pit 4211. There are only two groups available for the period c. AD 170-210, neither of which is likely to be representative of normal levels of samian consumption at this time. Indeed, the group from Well 6280, where samian forms c. 22% of the pottery by EVE, is evidently a structured deposit with several complete or near-complete vessels. 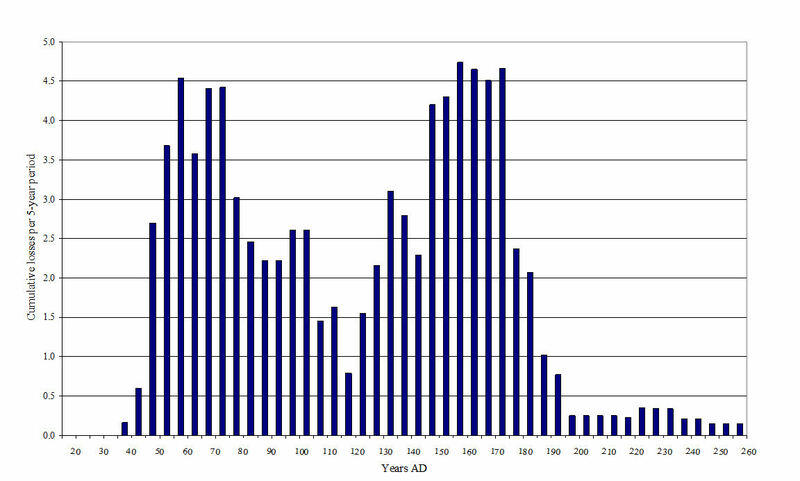 The three groups of early to mid-3rd century date (Ceramic Phase 8) are all near to the mean for that phase. Table 19 lists the equivalent data to Table 18 when weight is the measure. Of the mid-1st to early 2nd century groups (Ceramic Phases 4 and 5) most groups have proportions of samian similar to, or a little below, the mean for the phase, verifying the validity of this mean (cf. Table 19) as an indicator. (This contrasts with the EVE results of Table 18, which are affected by skewing owing to the small EVE totals of some groups). The highest proportions occur in Ditch 17086 and Pit 20174 but amount only, in both cases, to just over 3% of the group. The overall picture is consistent and emphatic; very small proportions characterise all fifteen groups. Turning to the ten Hadrianic to mid-Antonine groups (Ceramic Phase 6), more variation occurs. Pit 10044 has a very low proportion of samian (a single sherd). The highest proportion is 6.7% among the smallish sample from Pit 4211. Seven of the ten groups have samian proportions under 3%. The highest proportions are 3.9% within the sample from Pit 7118, which yielded a range of samian items, and 4.4% and 6.7% from comparatively small-sized pit groups in Area K.
Four groups are available for the period c. AD 170-210. These include the sample from Well 6280, wherein samian forms 15% of an evidently structured deposit. The remaining three groups, as with the four groups available for Ceramic Phase 8, c. AD 210-260, all have low proportions of samian, though with some degree of variance from their respective means. In her report, Brenda Dickinson documents the proportion of all the samian recovered in each area of the site. This information is of intrinsic interest, but needs to be calibrated in order to overcome biases arising from such variables as differential levels of archaeological input. Only then can any actual patterns in the distribution of the remains be established. In order to achieve such calibration, one can examine the proportions of samian within groups from different areas of the site. The thirty-five KPGs and wider pool groups listed in Table 19 come from various locations. In principle, plotting the spatial incidence of these groups by site area (and chronological phase) might be thought useful, carrying the prospect of identifying areas of above and below average frequency of samian, and other patterning, that might be significant. Other recent studies have plotted the proportions of samian occurring across sites in order to isolate trends with regard to different functional and status areas, as at London (Milne and Wardle 1993) and Lincoln (Darling 1998). In the event, little patterning is discernible from the Heybridge data. A larger number of samples, together with a more even spread of samples spatially and chronologically, would be desirable in order to establish the presence of any spatial trends. Only three areas have more than three samples available, namely Areas H, I and K, with the latter being the source of nine samples. The majority of the groups are located in the vicinity of the temple/core area at the western end of the examined area. A few observations may be significant. Area K, with the largest number of sample groups includes both the group with the highest proportion of samian (excluding the structured deposit, well 6280 of Area H) and the group with the lowest proportion of samian. This may simply be a function of the fact that this area has the largest number of samples. Virtually all areas with two or more sample groups include groups with both comparatively high and comparatively low percentages of samian (i.e. Areas D, E, G, H, I, K and L). An exception is Area Q, where two samples available have relatively high proportions of samian, both at 3.2% by weight. Finally, it is worth noting that sherds from a samian inkwell (Ritterling 13) were recovered (from fill 4212, Pit 4211). This form is functionally specific and is unlikely to have been distributed in the same manner as other samian forms. Samian inkwells are very rare site finds, and are almost invariably associated with Roman military sites and major civil centres where they occur at or near fora and other sites of business and record keeping (Willis 2005). In other words, their distribution is highly structured. Unlike writing tablets and styli, which were principally to do with the recording of information over the short term in a relatively cheap format, the presence of an inkwell implies the documentation of information for keeping over the long term (or long transit) and an investment of some wealth, owing to the relative expense of ink and the receiving medium, either vellum or papyrus. The vessel is South Gaulish and was recovered from a Ceramic Phase 6 context, so it was either residual or (not surprisingly) had had a long life. The association of this find with other forms of evidence is consistent with the possibility that better quality building/s existed here, by the western margin of the excavated area (Mark Atkinson, pers. comm.). Table 20 records the proportions of decorated samian by source, based on the number of vessels represented. These data have a chronological dimension in so far as the sources of samian at Elms Farm are sequential. The table uses data for the whole recovered assemblage as identified by Brenda Dickinson and provides a potentially useful guide to the consumption of decorated ware (mainly bowls, but including some beakers and other closed forms), as opposed to plain samian forms (largely cups, platters and dishes). The present data (in this form) convey an instructive picture for the composition of the assemblage, which is helpful at a number of levels. Broad trends are apparent. Further study of the samian might look at the whole sample using EVE as the measure of frequency and at these data by phase; this would doubtless present significant information (but would take time to generate). The present data suffice as a general index. 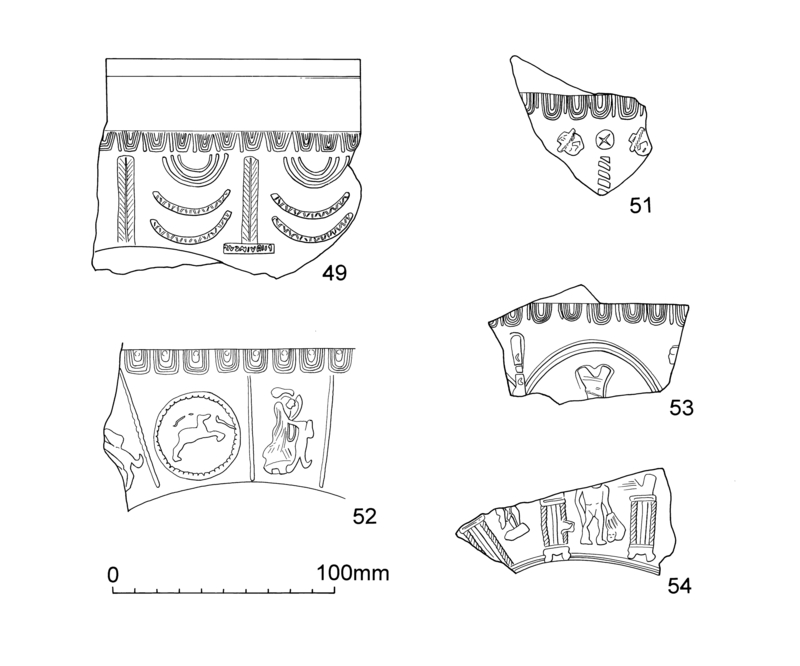 Assessing levels of decorated forms among samian assemblages is a useful undertaking since it has been demonstrated that systematic differences in proportions occur at different types of site (Willis 1997a; 1998). 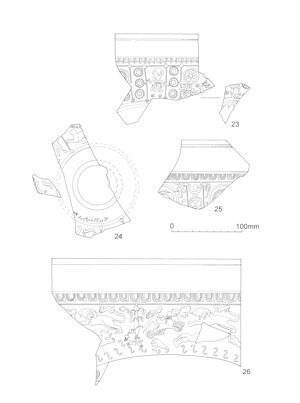 Decorated samian vessels, such as bowl forms f29, f30 and f37, are often thought to have been comparatively valued items because of their unusual character, and also more expensive to produce and transport than plain forms. It may be that these vessels were prized not because they were decorated, but because they were bowls and potentially drinking vessels (Willis 1997b). If decorated vessels were valued more than other vessels, the incidence of such items may be an index of site status and identity. Alongside Table 20 relating to Elms Farm, it is possible to present, via Table 21, some comparative data for other sites in Britain. Table 21 is a 'short-hand' summary of more detailed information published elsewhere by individual site and stratified phase group (Willis 1998, table 3). Table 21, shows that there were clear differences in the character of samian consumption at different types of site. Among the fifteen samples from major civil centres in Britain, for instance, only one sample has a percentage for decorated ware below 20%. However, among sites lower down the settlement hierarchy, including small towns, roadside settlements, smaller nucleated centres and rural sites, proportions of decorated ware are very often below 20%. This is the case at Neatham, Hampshire, where decorated forms account for only 14.3% of the assemblage covering the period c. AD 150-235 (Millett and Graham 1986), and at Towcester, Alchester Road, (Phase 2, c. AD 170-270) where the equivalent figure is 13.2% (Brown and Woodfield 1983). In Building AJ at the 'small town' at Kenchester, Herefordshire, decorated ware formed 20.7% of the samian from Period 2c (c. AD 140/150-180/200), though the building was of some pretension (Wilmott and Rahtz 1985). These systematic variations between different types of settlement raise questions regarding samian form and function, as well as variations in the perception and use of samian vessels at different types of sites. Comparison between Tables 21 and 20 suggests that Heybridge compares closely to the 'norm' for the small town, roadside settlement and smaller nucleated centres. Decorated vessels form just under 20% of the South Gaulish samian during the mid- and later 1st century AD. The proportion with regard to Les Martres samian is higher, probably since the industry seems to have produced disproportionately more decorated bowls than did the other industries, and because there may have been an unusual 'delivery' of Cettus bowls from this source (Dickinson, above). The proportion of decorated vessels falls somewhat within the mid- to later 2nd century material from Lezoux, with the proportion at c. 16%. Significantly, a similar pattern has been noted elsewhere, as at Catterick, North Yorkshire (Jeremy Evans, pers. comm. ), and at Lincoln and Verulamium, insula XIV, where Darling (1998) has identified a general decline in the proportion of decorated sherds dating to the 2nd century. The percentage for East Gaulish samian is not dissimilar from that of the Lezoux ware at 17.2%. Quite strikingly, only five out of a maximum number of 101 vessels in Colchester samian are decorated forms (Table 20). As Brenda Dickinson states, the paucity of other collections of Colchester samian of any size makes assessment of the finds from Elms Farm difficult. It is unclear whether this low proportion is a function of perhaps relatively fewer decorated forms being manufactured by the Colchester industry (cf. Bird 1999, 76), the status of Heybridge, or the preferences of its consumers and their perception/definition of Colchester samian. In other words, was there simply little decorated Colchester samian available, or were the consumers at Heybridge using Colchester plain samian ware but preferring their decorated bowls to be from the technically more accomplished Central Gaulish industry? On the whole, the picture that emerges from Table 20 is one of broad consistency in the levels of decorated ware through time. Variance occurs only with the less important sources of supply (Colchester and Les Martres) and, in these instances, may relate more to the output of those industries rather than be specific to Heybridge. Significantly, when the numbers of vessels from all sources are aggregated, the percentage formed by decorated vessels is 16.9%, a proportion that is very close to the mean for six samples from other sites of middle rank scale and probable like functions (Table 21; these sites include Baldock (excluding structured deposits), Castor (Water Newton/Durobrivae), Kenchester, Neatham and Towcester). Discounting the Colchester samian results in a similar percentage of 17.2%. Overall, a picture emerges of a familiarity with samian among the people living at Heybridge, or whose lives related to Heybridge, but samian was not commonplace. Samian was evidently supplementary to the ceramic repertoire at Heybridge, though seems to have been invested with particular significance by its users. Some vessels may have been in everyday use, others (perhaps the majority of vessels) may have been saved for special days and events. As elsewhere in Roman Britain, there was clearly no social restriction regarding access to samian. Heybridge, however, was almost certainly, vis-à-vis continental samian, at the end of a long chain of exchange, and evidently did not exert a particular 'pull' in acquiring samian. Indeed, it was probably at the tail of 'down the line exchange'. Nonetheless, it is significant to note that the frequency of samian at Chelmsford is hardly higher than at Heybridge, despite the fact that Chelmsford was almost certainly the main market centre for central Essex at this time. Table 21 indicates high proportions of samian occur at military sites and sites at the apex of the settlement hierarchy; in short 'high' levels of samian consumption are associated with sites closely articulated with the inter-provincial/Imperial economic system, with users familiar with metropolitan Roman material culture, and centres of higher status. The pattern of samian evidence from Elms Farm shows a comparatively low level frequency of consumption, but one that is normal for a smaller nucleated settlement. In so far as samian was an indicator of social status, this seems to have been a particularly urban phenomenon; relatively low levels of samian per se, and of decorated vessels, at small towns, roadside settlements and smaller nucleated centres like Heybridge suggest there was 'less status' - or rather less individuals with wealth and status - at such sites, and/or that status within such milieux was not commonly displayed by means of the ownership of samian. On the other hand, the selection of samian vessels for inclusion with burials and structured special deposits, where it often occurs with a frequency at variance to its representation in normal site deposits (e.g. Tables 18 and 19, Well 6280), indicates that here, as elsewhere in the Roman province, it was regarded somewhat differently from other ceramics. In sum, the occupants of Roman Heybridge had an awareness of samian, which was available to users throughout the importing period (c. AD 20-260). Its prominence in the everyday use of ceramics was probably moderate, and, besides, it was not necessarily in common daily use. There is clear evidence that it was regarded differently from other contemporary pottery types. Overall, the patterns of samian consumption at Heybridge, defined through these analyses, accord with trends identified at other smaller nucleated sites of the period.